If your kids love Minecraft and watching endless YouTube videos, they'll LOVE Nethermined 3. Back for it's third year, this unofficial Minecraft and YouTube event will take place at Newcastle's Student Union on 11th and 12th February 2017. Tickets are priced at £18 per person per day with under 3's and carers being admitted free of charge (they still need to book a ticket though). Limited VIP tickets are also available for £30 each which will give children/teens the chance to gain early entry to the venue and meet and greet the YouTubers before anyone else. Our children loved Nethermined last year and can't wait to return in 2017 - they are HUGE Minecraft fans and taking them to an event like this earns you great kudos as a parent. 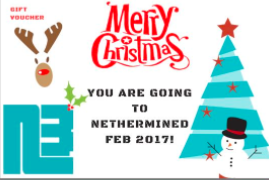 If you'd like to book tickets for Christmas, Nethermined have designed a handy gift card you can download when you purchase tickets and place in a card for your kids to open on Christmas morning. I really don't have a clue who these people are but my kids do and that's what matters! As a non-minecraft playing grown up (and blogger/vlogger myself) it was actually really interesting to hear older kids/young adults talk about Minecraft and YouTubing and sharing their advice. It's a really good chance to get a glimpse inside your children's world! Also I really want to encourage my children to learn about YouTube as much as possible - both the possibilities and the dangers and risks and attending an event like this is a fantastic way to do this.